Nursing Department Chair Stephanie Powelson and her husband Thomas H. “Tim” Tucker have pledged $15,000 as part of the “Bright Minds Bright Futures” Campaign to support the nursing lab at Truman. Their gift will be used to create an endowed fund intended to encourage the growth and development of the nursing lab. Powelson has been with the University since 1996. She currently serves as a faculty member and chair of the Department of Nursing. Tucker earned his Bachelor of Science degree in biology at Truman in 1976 and serves as the director of Student Resources at A. T. Still University. The “Bright Minds Bright Futures” Campaign is the University’s first comprehensive fundraising campaign, designed to help Truman achieve its vision of becoming the nation’s premier public liberal arts and sciences institution and elevate its profile among all liberal arts schools. The Powelson/Tucker Nursing Lab Fund will be administered by the Department of Nursing to support the nursing lab. The Fund is an open fund capable of receiving additional contributions. To learn more about “Bright Minds Bright Futures,” visit http://campaign.truman.edu. Middle school students interested in science and careers in the health care field can get hands-on experience during MASH Camp July 14-15. Each summer the Northeast Missouri Area Health Education Center (NEMO AHEC) presents a MASH (Missouri AHEC Science & Health) Camp for area middle school students. The MASH Camp provides hands-on experiences to students interested in health care and science occupations, and exposes them to a variety of careers in the science and health field. MASH Camp will take place from 8 a.m.-4 p.m. July 14-15 at the Northeast Regional Medical Center and the Truman campus. Area health care providers and educators will combine their talents to present an impressive instructional program that will introduce students to the fascinating world of science and health care. Students will participate in chemistry and biology labs, scrub labs, suture labs, hospital exploration, recreational activities and more. Any student who will enter sixth, seventh or eighth grade in the fall is eligible to attend. Enrollment is limited to the first 30 applicants. Registration requires a $30 fee for meals, activities and t-shirt. A limited number of scholarships are available to families in need. Thirty students from Atlanta, Edina, Green Castle, Kirksville, Lancaster and Moulton, Iowa attended MASH camp in 2009. For more information call NEMO AHEC at 887.303.2938. MASH Camp is sponsored by A.T. Still University, Truman State University, Northeast Regional Medical Center and the Missouri Area Health Education Centers. As part of the Learning Commons initiative the IT Service Center has moved to Pickler Memorial Library. The idea of a Learning Commons is to provide a central space where staff members from Library Reference, IT Services, the Writing Center, etc., can coordinate to provide one-stop, on-demand assistance in many areas related to teaching and learning. The IT Service Center includes Help Desk support, AV equipment checkout and Telephone Services. Because of budget and other liability issues, the IT Service Center can no longer provide antivirus or spyware assistance for personal computer systems. For the 2010-2011 school year, Truman had five students accepted into the Fulbright U.S. Student Program. The last day for the Medical Leave Bank Open Enrollment will be June 30. Further details regarding the program may be found at http://hr.truman.edu/programs/mlb/MLB_procedures.pdf. The Learning Technologies Team has scheduled several C-Level SMART Classroom sessions for July and August. These sessions will provide instructors the opportunity to refresh their SMART Classroom skills for this next academic year. For those who have never taught in a SMART Classroom, please note the orientation portion of the “Teaching with Technology” session IS required to teach in a C-Level SMART Classroom. Additional opportunities may be offered in January before Spring classes begin. The Learning Technologies Team is also offering instructors a chance to spend an hour of individual hands-on time honing their teaching skills and reaching their comfort level in a C-Level SMART Classroom. An Instructional Designer will be present to assist and to answer questions. Call 785.7750 to request a session. Along with the SMARTBoard sessions, additional classes have been scheduled that will cover lecture capture should instructors wish to record their courses, Blackboard topics, pedagogy for the incoming class and more! 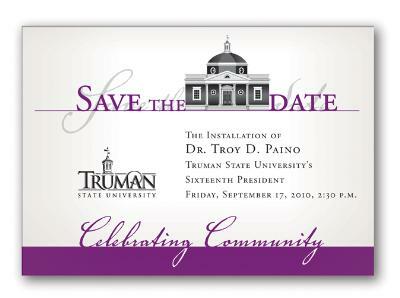 More details may be found online at http://ltt.truman.edu or at the registration page at http://eventmanager.truman.edu/generallist.asp. Please join us to celebrate David’s accomplishments after serving Truman State University for 15 years. The University Bookstore’s Textbook Rental Program for the Fall semester is now available in the store or online at http://truman.bkstore.com. The Reference Desk and Reference offices are being renovated to serve you better. Stop in to see our new look! The next issue of the Truman Today will be available online July 12 and in print July 13. All submissions should be made by July 7 to tmiles@truman.edu. Curtis R. Blakely, professor of justice systems, has been elected to the American Correctional Association’s Delegate Assembly (Institutions of Higher Learning). In this position, Blakely will influence the design and delivery of corrections-related education by representing America’s colleges and universities. He will serve in this position until 2014. Blakely will be appointed at the 140th Congress of Corrections on Aug. 2 in Chicago. Philip Brandyberry, a student in Criminology 331, had his review of “Criminal Justice: The Essentials” published in the Academy of Criminal Justice Science’s magazine ACJS Today (June 2010). Melissa Passe, speech and hearing clinic director, and Janet Gooch, communication disorders chair, along with communication disorders graduate students Katie Sloan and Kaycee Lukach, participated in a screening sponsored by the Scottish Rite Organization on April 24 at the Kirksville Shrine Club. Doctors associated with the Shriners conducted orthopedic screenings while the CMDS students conducted speech-language and hearing screenings for local community members. Sheila Garlock, assistant professor of communication disorders, and communication disorders undergraduate students Kimberly Bickel and Elizabeth Pfaender, performed speech-language and hearing screenings at a preschool in Unionville, Mo., March 19. During the month of February, Ilene Ashbaugh, assistant professor of communication disorders, and Melissa Passe, speech and hearing clinic director, along with several communication disorders graduate students, performed speech-language and hearing screenings at the Kirksville Child Development Center and the Mary Immaculate Catholic School.